This week is National Apprenticeship Week (6-10 March), run by the National Apprenticeship Service and celebrates the positive impact which apprenticeships can have on developing individuals, businesses and the wider economy and opening up career dreams for millions of people every year. One particular area which is seeing a surge of development in the UK is the construction industry, with the high demand for more housing being a key focus for many city and district councils. One such council, which has recently begun work on building and regenerating its area, is Bolsover District Council. 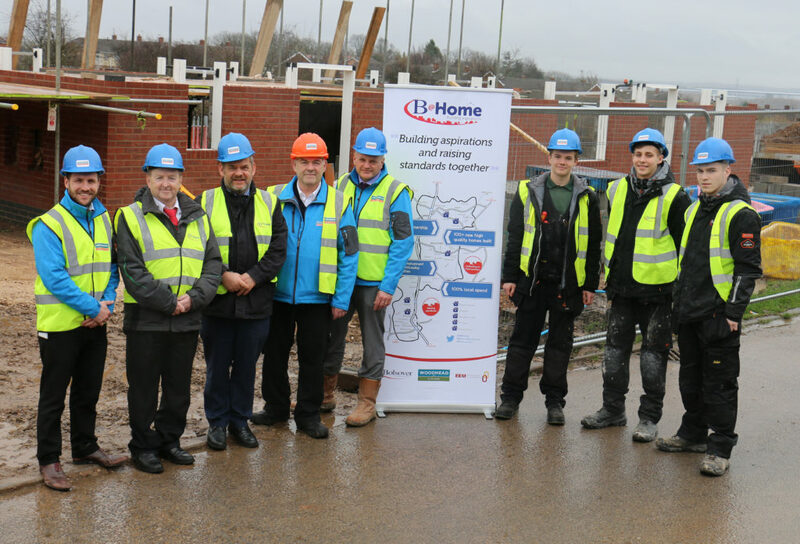 The B@Home partnership was launched last year between Bolsover District Council and Robert Woodhead Ltd through the Efficiency East Midlands (EEM) Ltd’s New Build Developer Framework to build more than 100 energy efficient homes in the local area in the next four years. And the initiative is very much about developing partnerships and delivering growth – not just to people needing to rent council properties, but also to construction apprentices who are gaining new skills, learning how to manage real-life situations on site and working together with all contractors on the B@Home development sites. Vision Apprentices, the apprenticeship arm of West Nottinghamshire College, is currently watching three of its apprentices develop carrying out maintenance work for Bolsover District Council, and making the most of the opportunity to learn additional skills on the new build properties on the Fir Close development in Shirebrook, an area of derelict land, which will soon contain six two-bedroom houses and two one-bedroomed flats. Josh Gozzard, electrical apprentice, Tyler Griffiths, joinery apprentice and Jake Rawson, plumbing apprentice are all employed by Bolsover District Council and already seeing the personal and career benefits of working on a live building site. Eighteen-year-old Jake, who lives in Alfreton, joined the council two years ago as a plumbing apprentice. He attends West Nottinghamshire College’s construction campus one day a week. “It’s great to be working on this kind of project. I’m learning lots of things I’ve never done before and it’s boosting my skills. On site you experience new levels of responsibility. I get my theory and some practical studies at college and then get to put it into real practice on site. All three apprentices are ready to get stuck in to the Fir Close development, after all having applied their trades at another B@Home site in Blackwell recently. Next week they will all work on ‘first fixing’ the new builds. “Working with apprentices isn’t a new concept for Woodhead. Part of the reason we won the tender was based on the employment opportunities we can offer local apprentices, not just because we can deliver the building works. “It’s a privilege to be part of this project with Woodheads and West Notts – long may it continue. Working with Woodheads is very reassuring as they have a good social conscience for working in partnerships and that’s been reflected in the award they won last week – the Building Communities award. “As a local authority we have a genuine and heartfelt commitment to take on apprentices and we have already agreed the key stages of construction where we know the apprentices are scheduled to come onto site. Tyler will be soon be involved in the installation of first floor joists, roof construction then internal studded walls and staircases. “This new build experience isn’t something we can normally offer apprentices as they’re usually involved in maintaining our council houses. This is a fantastic chance to test their skills in brand new homes.